Smart bracelet camera, or wristband camera, is one of the latest poker scanning cameras now and seldom guys know about it. Being known as a smart device for users to see the time, to record real-time data such as exercise in daily life, or to make calls or send messages, smart bracelets are quite popular nowadays all over the world. This makes the smart bracelet a perfect cover for poker scanning cameras. While being compared with other poker cameras, the bracelet scanner camera has the following advantages. 1stly, the smart bracelets are quite popular use these days everywhere. People won't pay any attention to it when you wear one smart bracelet while playing poker games. You can sometimes see the time with it as well. This is very important for that people won't find any difference on your smart bracelet with scanning camera inside, which ensures the safety for you. 2ndly, the smart bracelet cameras work very well for reading invisible barcode marked cards. Being one of the latest scanner cameras, it has get the best technology in poker cameras and can read the marked cards in a high speed whenever they are on the poker table or in hands. 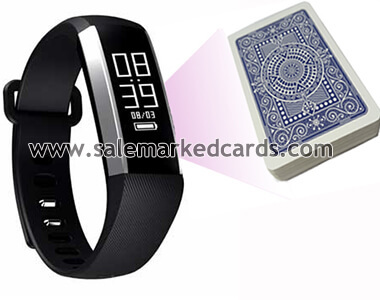 3rdly, the smart bracelet camera is mainly for the dealers and don't need to put on the poker table. To those who play in the places that forbids other items on the poker table, the smart bracelet scanner camera is a good choice. 4thly, the smart bracelets can easily change the batteries. When you ran out the power, you can just change the battery with a new one. What's more, the batteries are rechargeable. Referring to all these advantage, don't you think it good? Do you still feel hesitant to get such a good device to help enjoying the poker? Just feel free to contact for more!